These paleo and gluten free coconut flour bars with layers of dark chocolate and coconut flakes are absolutely incredible! You’ll be amazed by how easy they are to make, too! So here’s the thing. I finally discovered how to bake with coconut flour. I experimented with it once before but after that I sort of gave up because I kept having recipe testing failures. Whomp, whomp. Then a few weeks ago I spotted coconut flour on the shelves at Trader Joe’s and decided to pick it up and do some experimenting. And guess what? I’m completely head over heels obsessed! I’ve make pancakes, waffles, cookies, and BARS. Last week I bought four bags. GET AT ME TJ’S. Of course with any recipe I make, I needed to test out a few different versions. Typically with coconut flour you need to use several eggs because the coconut flour holds an insane amount of moisture. When I say several, it means 4-6 per recipe; that’s a lot of eggs and I didn’t want these bars tasting like an omelette. Instead I opted to use only two eggs plus a little coconut oil and honey (or maple syrup) to help bind the bars and keep them super moist. And after the third round of testing, they came out just perfect! Low in carbs: Coconut flour is lower in carbs then regular flour and it packs some serious fiber. You don’t need to use as much: Since coconut flour is super absorbent, you won’t need to use as much. This recipe only calls for 1/2 cup. Great for the paleo diet and it’s gluten free. It’s fun to experiment with. Thanks to Pinterest there are hundreds of delicious coconut flour recipes. The best part is that now you totally have a reason to go out and buy coconut flour. This recipe is completely easy to make. 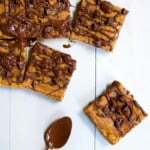 The bars are more cake-like, fairly soft, but the perfect indulgence without guilt. QUESTION FOR YOU: Would you like to see more coconut flour recipes on AK? Incredible paleo and gluten free coconut flour bars with layers of dark chocolate and coconut flakes, if desired! 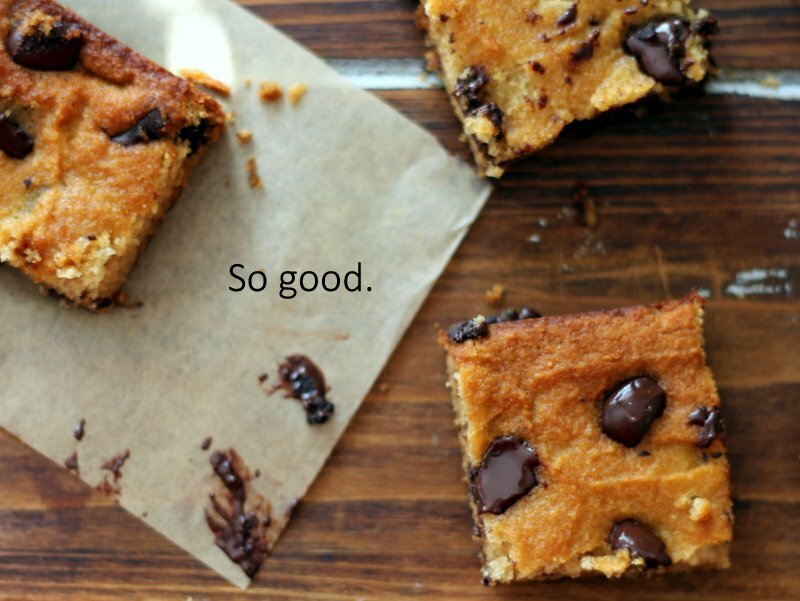 You'll be amazed by how delicious and easy these bars are. Preheat oven to 350 degrees F. Spray 8x8 inch baking pan with nonstick cooking spray. In a large bowl, whisk together coconut oil, honey, vanilla, eggs, and almond milk. In a separate medium bowl whisk together coconut flour, baking soda, and salt. Add dry ingredients to wet ingredients and mix until just combined and batter is smooth. Fold in chopped chocolate, reserved a few tablespoons for sprinkling on top if desired. Bake for 20-22 minutes or until edges are golden brown and knife comes out with a few crumbs attached. The batter may look like it's not all the way cooked but it will be. DO NOT OVERBAKE or it will result in dried out bars and no one likes that! I always bake mine for 20 minutes and don't have any problems. Cool bars on a wire rack for at least 10 minutes so that they settle a bit, then cut into 16 squares. Enjoy! I used Trader Joe's Coconut Flour. I like to sprinkle extra dark chocolate chunks on top or melt a little extra chocolate and glaze it over the top of the bars. These are also especially delicious with a sprinkle of sea salt on top. Coconut flakes are not included in nutritional information, but the chocolate is. 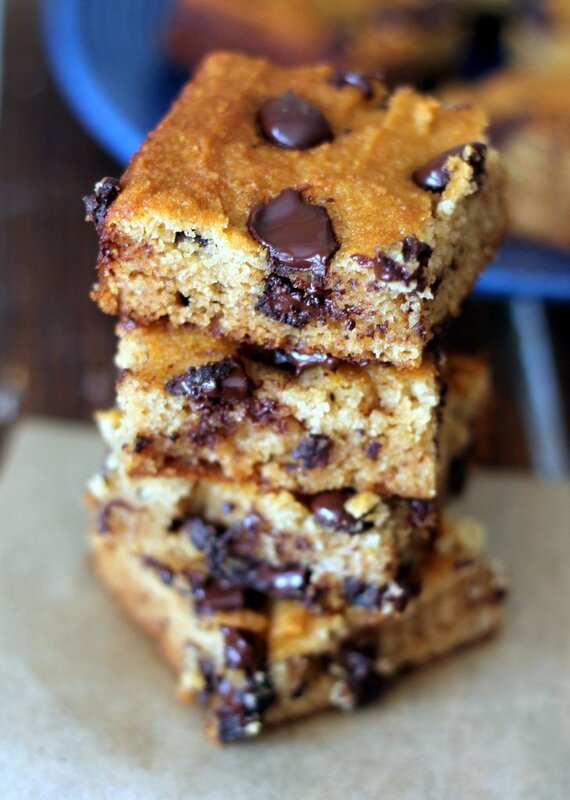 253 Responses to "The Best Coconut Flour Chocolate Chunk Bars"
I would love to see more coconut flour recipes! I bought some from Trader Joes a few weeks back even though I had no idea what to do with it. Can’t wait to try these bars!!!!! I agree. I have a bag of Bob’s Red Mill Coconut flour waiting to be used for something, but I wasn’t quite sure how to go about using it. I don’t want to have a bunch of fail attempts, which I how I ended up here looking at your recipe. I think I’ll try this one today, but please post more if you can! Thank you so much for this recipe. I too have had bad outcomes with coconut flour but decided to give it another try. They turned out wonderfully. I did not have almond milk so used whole cow’s milk so I was surprised. And i used Trader Joe’s semi-sweet chocolate chunks, 1/4 c. The dough was very crumbly when putting it into the pan so I figured “oh well, another disappointment”. I baked them for exactly 20 minutes and when I took them out the edges were a nice light brown but they still looked very crumbly. Imagine my surprise when I cut into them and they held together nicely. I still didn’t think I’d be able to pick them up to eat but I did!! I sprinkled some powdered sugar on the top and two squares were very filling, about 1 1/2 inch each. These will be fixed again even for company!!! I’ve signed up for your newsletter. Thanks again! I would love to have more coconut flour recipes – BUT I can’t have eggs…. (weeps silently into her mixing bowl) so it’s really difficult for me to find anything useable. I can find the dairy free coconut flour stuff, but not egg free. So if you went in that direction….. I would be all about that! Perhaps you could use a flax egg or banana to help bind?! i always make it vegan! so applesauce is my go to binder for reg flour baked goods,BUT for this I used pumpkin puree& a but of chia mixed in! I am allergic to chicken eggs but I can do duck eggs which are amazing to bake with. 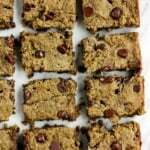 I have used flax seed supp with good success with coconut flour recipes here. Take 1 Tbs. of Flax seed and put in 3 Tbs. water and let set 15 min. in refrigerator to gel. Happy Baking! I have made this with flax and chia seeds. I used 3TBSP of either seed and 9-10 TBSP of water. To make it a gel quickly I heat the seed and water mixture for a minute on the stove. It works out great! What if you only have coconut milk ? Would it work with this recipe ? Coconut milk should work in these! I have no clue why but mine turned out awfully spongy?? Is this the texture that it tends to be when using coconut flour? Yes, it’s the texture, very moist and cake-like. It can be super difficult to work with but these bars changed my mind! 🙂 Hope you like them. YES MORE COCONUT FLOUR RECIPES!!! I’ve been wanting to experiment with coconut flour! This may be the recipe that I should start with! Just made these – so good. Thanks for the recipe!!!! So good!!!! Wow! You’ve redeemed this flour for me! Ok, so I know I’m a little late to the party but these are insanely delicious! Definitely can’t stop at one…or two. I thought they would be more “bar-like”(firm, like a slice) but it turned out more cake-like. Doesn’t matter though cos they taste incredible. Thanks for the recipe! Can’t wait to try! What would you recommend instead of almond milk? Nut free here! Soy milk would work or coconut! Really any milk – flax milk, hemp milk! Hi, could I substitute xylitol for the honey do you think? I was wondering the same. I would prefer to use xylitol or coconut sugar. What would be the ratio? You could try using coconut sugar (I’ve never baked with xylitol) – I would just add a bit more than the recipe calls for. I have tried several coconut flour recipes that failed in flavor and texture. THIS IS A TOTAL HIT!!!! Thank you so much for this deliciousness!!! Yes!!! I agree! This is amazing. Great flavor, taste, and texture! I will grease the pan next time though. So good! These are incredible! Made them last night and the hubby asked if we could eat the whole pan. Would love to see more coconut flour recipes! Delish! I had the same problem!! Okay this recipe may have finally convinced me to give coconut flour another go. Since I am vegan, I will try with flax eggs. Wish me luck! Sounds like they needed to cook more. Was your oven temperature off? Did a toothpick inserted into the middle come out clean. I haven’t heard of anyone else with this issue. What brand coconut flour did you use? I followed your recipe exactly and they came out like Natasha’s & Rama’s. They taste good but are crumbly and fall apart. I think they needed more than 1/4 c almond milk if you add the coconut flakes (which I did). I used Trader Joe’s coconut flour. Thoughts?? Sorry you had a problem Karen. I’m not sure why some have this problems and others do not. It sounds like you may have overcooked the bars. You can definitely try adding a bit more almond milk or another egg. Monique, it might be helpful if you could state what consistency the batter should be in your recipes. If we can gauge our batter consistency on what you put in the recipe maybe we can be more on target with correct consistency and better end results. Thanks. Thanks Monique! 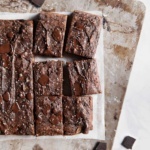 Was wondering if this recipe would be still good using less chocolate pieces, maybe 2-3 squares of Lindt 85% cocoa, that is what I always have on hand, and then add pure cocao powder maybe 3-4 Tablespoons? I don’t want to use up my whole suppy of chocolate bars. Thanks for your input. Was wondering what level should the baking rack should be? I generally use the mid level. I am not a vivid baker so don’t have the experience to know what level to use. I think it would be good if you put the level of the rack in your instructions. I use mid level as well! I only had coconut milk, so I used that instead of almond milk. I also used low quality Maple Syrup. They were really, really moist and weren’t very stable for eating purposes. BUT it’s possible the stability was the fault of my substitutions. They were yummy and my hubs is pretty much consuming the whole pan as I type. 🙂 Thanks for the recipe! Very tasty. I have to say these are delicious for the recipe calling Coconut Flour. Other recipes I’ve tried with this ingredient really pronounces the coconut and is very grainy. I like that you only added 2 eggs, because I also don’t like my baked goods like omelettes, ha! Loved baking this on a Sunday morning to go with my tea and is extremely guilt-free 🙂 Thank you for sharing! Hi these were great thanks, cake like my only problem is there is quite a bit of ‘oil’ coming off the bottom (on the parchment paper etc) should I reduce the amount of oil? I actually used almond oil instead of coconut was that a mistake?! Hi Nadia! Yes, you should have used coconut oil. I had the same problem using coconut oil so I’m going to reduce just a bit to see what happens. Have a batch in the oven right now! So easy to make! Would it work if I substituted applesauce for half of the money? I haven’t tried it, sorry! Also applesauce and honey aren’t quite the same My recommendation would be to try and reduce the honey to 1/4 cup and add a little more almond milk. So delicious. Yum. Definitely my new favorite go-to for parties. Thanks! Is it possible to substitute the coconut oil with regular canola oil? Or will that severely change it? I have all the ingredients except the coconut oil and I am dying to try these!! Tree nut allergies here, so all coconut recipes are appreciated! I will use dairy, as a small amount doesn’t bother me. Going to try today with my own sugar free chocolate chips. These are really great. 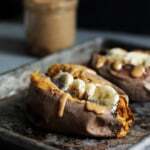 Whipped these up for a quick fix and they did just the job! these were rely delicious, soft and subtly vanilla with big chunks of gooey chocolate!I did have to double the batch in order for it to fit my pan but that made them extra thick and delicious. I also had to add a half cup of coconut milk than the recipe calls for for added moisture. thanks for the recipe! will make again! Just made these in muffin tins, as I don’t have an 8×8 pan. I did not use vanilla extract (just moved and don’t have it!) and I added some additional almond milk, as the recipe seemed way too dry. I baked them for about 20 minutes at 350 and they turned out really well. The consistency is more cake-like, but enjoyably fluffy. Thanks for the recipe! After a failed coconut flour blueberry muffins (literally right before I baked these), I was hesitant to try the flour again but your bars sounded so good. And – they came out perfect! I used white chocolate instead of dark. Seriously delicious and I can’t wait to make them the next time I have dark chocolate on hand! These bars look super delicious. I also just bought a bag of coconut flour from Trader Joe’s. I love how your recipe doesn’t use an absurd number of eggs. I’ll definitely be trying this out when the weather gets cooler. Oh my gosh! I just tried these and they’re a delicious mess. I definitely got impatient because they made my house so hot, haha. I think I could have maybe used less oil? Great recipe though! I made these today and they’re delicious. Mine were a light, cakey consistency as some others have reported. I made them exactly as specified, and added 1/4 cup of coconut flakes. I’ve heard that coconut flour is extremely sensitive to the ratio of flour to liquid, so I’d imagine that something as simple as the size of your eggs could affect the texture of the end result. I used very large eggs, so that may be why mine was cakey, or I may have mixed too much thus incorporating air bubbles into the batter. I’m going to aim for a chewier consistency next time, but these are worth making again regardless! Ooh.. As others mentioned, I haven’t had great success with coconut flour and have two bags. These look amazing! And I love that they don’t require many eggs. Will definitely try them! Did you use the correct pan as indicated in the recipe? They should be somewhat cakey. What texture should the batter mix be? Like a normal cake mixture or thinner? Mine was v watery. Yes please! More coconut flour recipes they look great! Just made these and OH. MY. GOSH. They are incredible! So light and flavourful, and not too sweet. I ate one after the other, they were that good! They were a little crumbly after coming out of the oven, but they were still manageable and held better the longer they had to cool. I just couldn’t wait to try them when they came out of the oven! Thanks for the great recipe! Do you think I could use this recipe for a cookie “cake” by baking it in a pizza pan? Any tips or suggestions much appreciated. The bars are more cake like FYI! I’m not sure about the pizza pan. What is the size of it? The pan is 12.5 inches diameter and has a rim of about 3/4 inches. I am thinking that because it is more cake like, it would make a better cookie cake, but I’m not sure. Thanks. Just made these and they’re amazing! I used carob chips and they came out cake-like, butter-y and delicious! Where are the optional coconut flakes supposed to go? In the dough or sprinkled on top? They are not mentioned again in the recipe. We have made this recipe many times. It has turned delicious every time! My wife makes them in a cupcake pan. They come out like little mini chocolate chip cakes. When doing them in bigger pans or loaf pans, they didn’t seem to cook through. Plus the cupcake pan gives you the great crust in each piece. She uses honey as the sweetener and she uses hemp milk instead of almond (i’m allergic). Great recipe! Just made these after seeing so many people make them on Instagram! I love them! 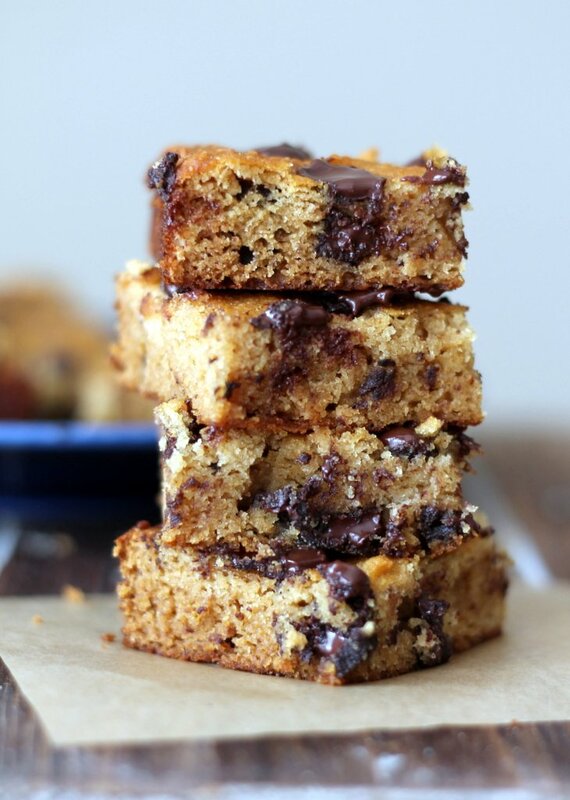 I was deciding between these and the chickpea blondies, so I definitely see the blondies happening sometime in my future! Thank you for your amazing, clean recipes. I have made several of your recipes and they always turn out great! This is the first dessert related recipe I’ve made from your blog l (I’ve made entrees, sauces, more savory recipes previously), but I can’t wait to make more of your desserts! I love how you can eat these bars and not feel awful afterwards because of the clean ingredients. Your blog is easily one of my favorites! If you don’t have coconut oil, what may replace that ingredient? I made these last week as is. I was also thinking of doubling the recipe. Advice? Wow…that looks fantastic. So dark and almost caramely. I bet the taste is out of this world! Since I don’t use coconut flour often with chocolate but I’d love to try these, since it looks so healthy. Thanks for sharing this recipe with us. I want to thank you so much for finally helping find something sweet that tastes so freakin good!! I can’t tell you how many coconut flour deserts I’ve made (and Im a great cook!) that turned out terrible, I had almost given up and saw this on Pinterest the other day and baked it today and WOW! absolutely love love them! I think I have been craving a sweet treat for so long on my very strict diet that I will make myself sick eating these!! yum! I would love to see more coconut flour recipes on your site. I got excited about it an ordered a large amount and love trying new recipes! Thanks for asking. Also I don’t keep much almond flour in the house since it doesn’t last long. Should I keep it in the freezer? I don’t think that’s necessary. Fridge would be fine. I meant oil not milk! OMG, I have the worst sweet tooth in the Universe but was just diagnosed with pre-diabetes. I can cook Savory, but can’t bake to save my soul because I eye ball everything. Tried this recipe and only after understanding the way coconut flour works I followed it with 2 substitutions. One extra large egg along with 1/4 Cup liquid egg for less Cholesterol and add 2 packages of Sugar Substitute. Do not over-cook and they were so awesome it’s hard not to eat the entire pan! Coming from someone that doesn’t bake Thank you So much Internet! ? Second time using coconut flour and these turned out exactly like your picture and just what I had hoped for. 20 minutes bang on. Only change was butter and whole milk for oil and coconut milk….DELICIOUS!! There is nothing paleo about this. All the sugar from the honey, agave nectar, and chocolate bar will cause a huge glucose spike that the cavemen never experienced. Just made these and they are DELICIOUS! I’m so happy that after several attempts using coconut flour, I’ve finally found a recipe that tastes good. Thank you Monique. Your recipes have never disappointed. The first recipe I tried of yours was the brown butter snickerdoodles. I’ve been a fan of yours ever since. I’m happy to see all your new healthy recipes. I’ll be back…. Can I use melted butter instead of coconut oil? So these taste delicious, but are crumbly for me. Is that what happens if they are overcooked? My batter was chunky and crumbly, and I suspect that has to do with the coconut oil. The batter was thinner at first and then I think the coconut oil started firming up since the eggs were cold. I’m curious if its the cooking time or the batter consistency that impacted the final texture, so I can fix it next time. Any guesses? This looks so devious! Love the idea of using coconut flour! I just tried them:) The flavor is really good! But mine don’t look like bars… It falls apart when I touch it. Like crumbles. It happens to me overtime I try coconut flour. Anything I might be doing wrong? Delicious!!! Just baked this for desert after dinner and my family loved them…the pan is almost gone. Will be definitely making this as a regular dessert. Would love more recipes using coconut flour. Thanks so much for your website. this recipe looks sooo good. can i substitute coconut milk for the almond milk? Just to say Kaitlyn, I used coconut milk and I had no problems. Yes more coconut flour recipes please!! have you tried freezing them at all? I thought they looked like a good school lunch box option, I only have the one though and we wouldn’t eat a whole batch fast enough. Hi. Im from the UK and converted your 1/2 cup of coconut flour to 90grams and made the recip. I had to add a lot more almond mix to make it mixable and whilst it tastes good it doesnt look like your pics. Could you tell me what measurement i should have used in grams please? I made this earlier today and have to tell you – it was amazing! The only thing I didn’t do was to use a spray to stop from sticking…I used softened butter and it needed help to get it out of the tin. I also used desiccated coconut which I added to dry ingredients. It was perfect in texture AND flavour and I can honestly say, it’s one that I shall be making again and again. Love this recipe! I added 1/4 c chopped pecans and used coconut oil to grease the pan. Simply delicious and many thanks for posting the recipe! Oh my goodness!!!! I just made these for my family and oh my word are they good!!!!!! Thank you for the recipe. Just made these! They are amazing!!!!!! Followed the instructions and only baked them for 20 minutes, and they are super moist and hold up with minimal crumble! Definitely making again!!! ? 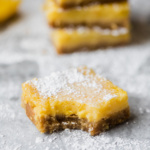 I just made these and the flavor is quite nice….the problem I had is that they are super gooey, need to eat with a spoon and didn’t firm up at all. I put them in quite a bit longer, so I know it is not cook time. I am at high altitude, above 7000 ft, so maybe that is it? Any recommendations for me? I am really looking for the chewy texture!! Thanks! That’s so odd! I’m guessing it’s an altitude issue. You should increase your oven temp by 25 degrees and reduce the sweetener in the recipe by a tablespoon. This may help! Thanks for the reply! I’ll try that…though they were still loved by all, even my super picky husband! delicious! I am glad I found this recipe. Thank you!!! Just made these and they are AMAzing!!! I used butter instead of coconut oil and powder vanilla instead because that’s what I had. I also used chunks of Lindt 85% dark chocolate. The batter was thick, so i mixed in a splash of extra virgin olive oil before baking. The end result was good. I enjoyed it and will ise this recipe again. So delicious! Really hard to believe these are grain and dairy free! Thanks so much! Can’t wait to try these! I have a lot of Almond flour – can I use that instead of the coconut flour? These bars turned out amazing! The combination of flavors is just perfect although next time I’m going reduce the amount of honey to 1/4 c as I thought they were a little too sweet and also use less salt. There definitely will be a next time! Thank you so much for this recipe! I really appreciate your work! Had to get back just to leave this comment: Yesterday I thought these bars were delicious but now on the second day they taste even better! They are definitely “the best“! Thank you so much, I love them! They are a win! I added 1/2T instant espresso powder. I always add it to my chocolate chip cookie recipe. Will def make again. Just made these and my whole family loved them! Not sure if we’ll have any left but do you refrigerate these after they cool? If not, how do you recommend that I store them? Fridge is great, but room temp is fine if you keep them covered. Thank you. Your recipes are amazing – we made the Double Chocolate Paleo Banana Bread and my whole family thought it was delicious! Ah wow. Delicious. Make these. I make these 3-4x a year. ALWAYS A HIT! I love that the recipe is always so easy to find! I am gonna substitute coconut milk this time and see how it works. So glad you love these! Let me know how the coconut milk works! I loved this recipe!! It was a huge hit with the fam. Maybe a liiiitle bit too sweet, but that might be because of the extra coconut flakes I put on. Thanks for the recipe!! I wonder if I can use any egg substitutes (like flaxegg) since I’m a vegan? Looking forward for other coconut flour recipies. These are currently cooling in my kitchen. I have a girlfriend who has an insane amount of food restrictions, so finding recipes that are “M friendly” can be a challenge. These jumped out at me and I can’t wait to try them. They cooked up like a dream! The only thing I would have to say about mixing the ingredients is that when I added the almond milk the coco oil hardened back up. Next time, I will make sure the almond milk is at room temperature, too. Update: Tried them. Holy Hannah they’re good. Made these exactly as per recipe and YUM!! The whole batch didnt even last 24 hours in our house. Seriously, they are good. Hi, these look amazing and just the thing I’ve been wanting to try! Can the recipe be doubled or is it a bit risky given the nature of coconut flour? Thanks! Hi Grace! You can definitely double this recipe – I would just make sure to use a larger pan (or bake them in 2 separate batches in the 8×8). These look delicious and I’m excited to try! Can the recipe be doubled just as is? These were astonishingly great! My husband is demanding a second batch. We crumbled them over fresh peaches. Delicious! Also, they’re really good cold! 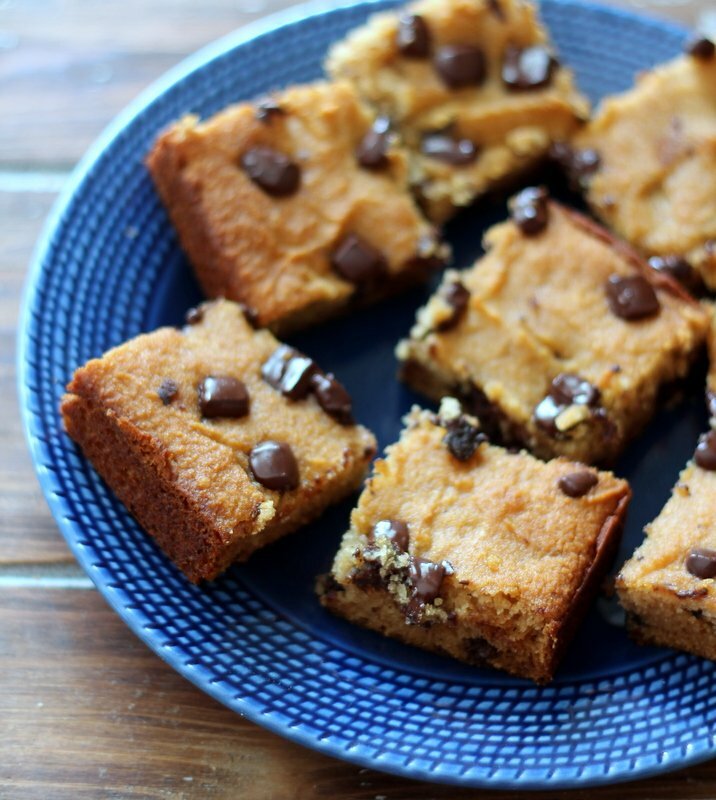 Our family loves these cookie bars! They are easy to make and very delicious. We enjoy the “cake-y” texture. Thanks so much for the recipe! Hi there!! Apparently TJ has discontinued selling their coconut flour – but still sell their almond flour. 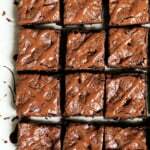 Can almond flour be used in this recipe? Can’t wait to try!! Ah – bummer! I wouldn’t recommend almond flour in place of coconut flour in here (as the texture will turn out very different). Try these instead! I JUST bought Coconut Flour at TJ’s today. Maybe it is just your store and you can order it online??? These turned out beautifully! I didn’t have shredded coconut, so I toasted a handful of hazelnuts in my preheating oven, then chopped them up and threw them into the batter along with the chopped dark chocolate. It turned out to be a great addition – the toasty hazelnuts get along really well with the slightly sweet nuttiness of coconut flour, not to mention hazelnut + chocolate = yum! After reading reviews about issues with the batter being too runny or crumbly, I decided to wait until the very end to add the milk and only add as much as I thought it needed to come together – I’d recommend doing that, as my bars turned out neither underdone nor dry! I also used an oval-shaped glass baking dish (same volume, just different dimensions) and it worked fine, I just had to watch it closely in the oven. It was done after about 15 min. We love chocolate but have to have it unsugared. Any ideas on how i can use cocoa nibs instead? Also i would love a blueberry bar recipe ! Please! I can’t seem to make one. Oh! Also a sandwich bread recipe would be awesome! I’ve been failing at this for a while. Feel free to use cocoa nibs in here in place of the chocolate chips! I’ll keep a blueberry bar in mind 🙂 And try out this bread for your sandwiches. Enjoy! I live on my own, so I halved the ingredients and made these this weekend, OMG delicious…I made a second batch 2 days later – so easy to make and very very tasty. Amazing! So happy you enjoyed 🙂 The perfect, easy treat for 1! These came out soooo nice and fluffy. The only thing is I don’t like honey and maple syrup has tlo much sugar could I use more almond milk or eggs instead? I’m glad they turned out super fluffy for you! I would try using agave nectar as leaving any sweetener out will really change the flavor in these. Hi Monique! These look so incredible, I can’t wait to try out this recipe tonight! Quick question – How long do you think these would keep and would they freeze well? Hi Sana! These should keep for about 3-4 days in a container on the counter, or about 1 week in the fridge. I haven’t tried freezing them but they should be just fine! I would have them cool completely, wrap them in either tinfoil or plastic wrap, and then put them in a ziploc bag for the freezer. Thanks for the recipe! Mine came out great! Made these today. First time baking with coconut flour. I added brandy soaked dried cherries like I do my scones. Batter was fairly wet. Cooked exactly 20 minutes. Slightly crumbly but if you are careful you can get squares on a plate. Very yummy. Those dried cherries sound amazing! Glad you enjoyed these Amy! My first attempt making these I chose to add some shredded coconut and a few chopped walnuts. One ounce square of 85% dark chocolate was plenty to give these a sinfully rich flavor. They were a bit delicate to get out of the pan but held together fine when cool. I put half in a plastic container and froze them. After two weeks they tasted as great as ever but when I took the container out of the freezer there was only one left! I think my wife likes them – a lot! They are so darn good it’s hard to eat just one, but at a little over 100 calories, why not! Making another batch tomorrow. Coconut and walnuts sound delicious in here! I’m so happy you and your wife both enjoyed 🙂 Perfect treat to keep in the freezer! I made these this am. Think I need to practice. When I mixed the wet and dry I must have mixed for too long but was worried about the lumps. Mixture became solid. Still taste OK and I swapped chocolate for coco nibs and blueberries. Very strange! I’m not sure how it would solidify. I would double check your measurements! Wanted to ask you Monique do you use refined or unrefined coconut oil in your recipes? I love the unrefined for better health benefits but like the refined for taste. I find using unrefined with cocoa you don’t taste the flavor of the coconut oil. I do not like the taste of unrefined coconut oil, except when I use cocoa in the recipe or if I fry potatoes with it, for some reason the flavor is hidden. I saute with refined coconut oil, that has no flavor. 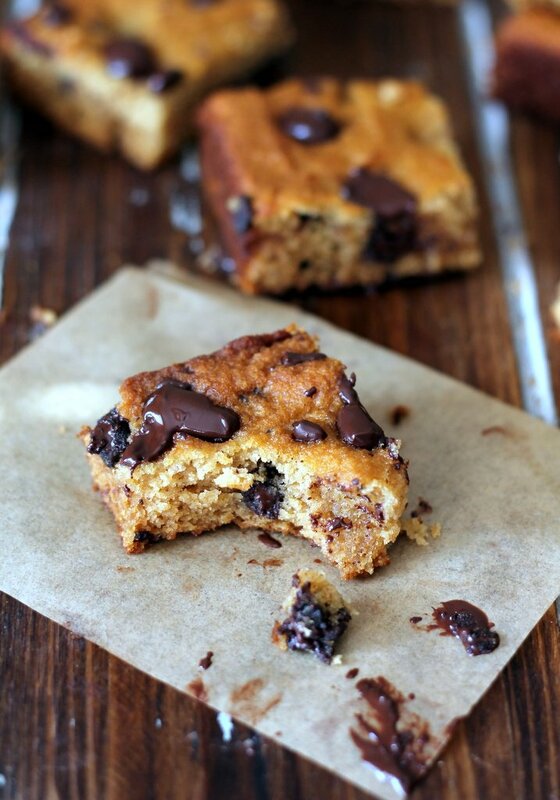 Your recipe with just the chocolate chips, can you taste the coconut oil, if you are using unrefined? Also, for sweetener, I found Lakanto-Monk Fruit/Erthritol blend works really well. They have one that is like white sugar and one that is like brown sugar. I get it from Amazon. No calories and does not feed candida and does not raise blood sugar levels. It is a better option than honey or maple syrup health wise. Thanks for all your wonderful recipes!! I like to use unrefined coconut oil for the coconut-y taste in baking and cooking! But either will work 🙂 These will also be fine with fewer chocolate chips, and if you add cocoa powder I would maybe add a tablespoon more almond milk! Thanks for your input. I had a hard time finding this recipe again to see if you had replied. When you put something in the search box does it have to be on a particular page? I tried it several times and it pulled up nothing. then i was in another area where bars were and did the search and it pulled up the recipe. Is there some easy way to get to your replies? Thanks so much! Hi Cathy! My replies should go to your email, or you can search by the recipe name. thanks. I have looked for your emails for your response, which do go in my junk file, but never found one. I will look again. Thanks so much!! Made these last night. Very nice, simple and delicious. I used Enjoy Life mega chunks and it turned out perfectly with those big pieces of chocolate on the inside. Great recipe but wonder what size baking dish you use. I was using a slice/sponge roll tin 20cm x 30cm and found it a little too long so I used some folded foil to block off the end of tin. Particularly like the fact that it uses only two eggs, most coconut flour recipes call for many more. Will make this often! This is seriously the best coconut flour recipe I have ever found! I make these all the time! My friends and family who don’t eat paleo love them! 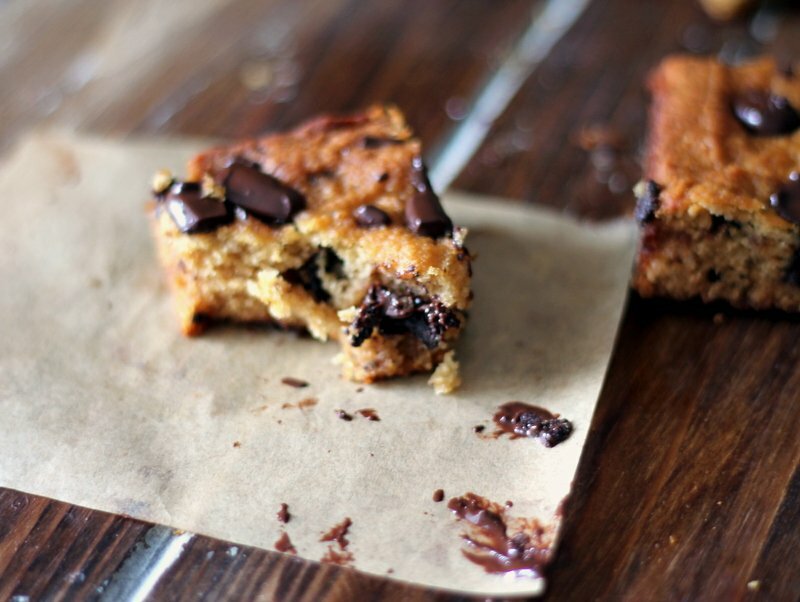 I LOVE LOVE LOVE these bars and the recipe. The recipe is fool proof and so easy. My bars were so moist and tasty. I wish they rose a bit more but next time, I’m going to double the recipe and use milk chocolate vs. dark chocolate. Mine are too crumbly. Tastes yummy but you can’t eat it like a bar. Any ideas what I did wrong? These bars are meant to be a bit soft because of the coconut flour, but I would double check your liquid ratio and baking time! these are delicious! i sprinkled the coconut on top instead of mixing in the batter…was roasted and looked beautiful. made the mistake of trying to flip them out of the pan way too early…fell apart all over the cutting board. which was fine cause i just ate it all up from there. made a double batch too, so have some pretty bars for sharing. you are so talented! all your recipes are amazing. That toasted coconut on top sounds incredible! Glad you loved these even if they fell apart a bit 🙂 Thanks for your note Amy! What size eggs do I use and is oat milk instead of almond milk ok, thanks. Large eggs and oat milk should work! Can I omit the salt and reduce the sweetener? Are these just for taste or do these serve a function? Hi Tracy! Feel free to omit the salt, but the sweetener is both for taste and for holding the bars together. Thanks..any idea what I could use in place of sweetener to hold the bars together? I used erythritol, and upped the nut milk. The coconut oil sets the bars really well once cold/refrigerated. Hi Tracy – you could try 3/4 cup mashed banana but you may need to add a bit more milk. I have been baking with coconut flour for years…some successes, some failures. I have some AMAZING go to recipes, including a cake we use as our birthday cakes every every year. This was a good tweakable recipe! I used 2T erythritol in place of the calorific sweeteners, and increased the nut milk by 3T. I also subbed roasted salted bashed almonds for the coconut flakes. It worked well for me, yep it’s a little cakey and a little crumbly, but if you let it cool properly and then cut, it works well! Also the coconut oil sets when cold, like if it’s refrigerated…you lose the gooey chocolate, but it’s still good. I’m glad those swaps worked out for you! Perfect healthy treat. This was my first time using coconut flour, but I am cooking for some gluten-free friends, so I tried them! I used 2% milk instead of almond milk, because I didn’t have any, honey, sweetened flake coconut in the batter, and they turned out great – baking for 11 minutes! I love gluten, so was a bit wary, but they are yummy! Thank you! These bars were delicious!! This was only my second time working with coconut flour. The first recipe I tried didn’t turn out as I expected, so I was a bit apprehensive, but this one worked like a charm. Thank you! I’m so glad you found this recipe! A great way to use coconut flour 🙂 Try these, too! I’m so glad you found this one! Check out these other coconut flour recipes, too 🙂 Hope you find more that he loves! I tried it this morning. It is very delicious. Thanks for this recipe. The only thing is that mine was not puffy like yours. What do you think is the reason? Thanks in advance. Hi Jade! Glad you liked these. The look of them can vary depending on oven temperature, exact measurements, etc. These are amazing!!! My husband ate the entire batch in one day 🙂 I baked them for 20 minutes and the texture came out perfect. Glad those swaps worked out and that you loved this one! Starting February, I’ve been doing low carb everything and ran into coconut flour at the grocery store. Looked up some recipes and saw this. I just tried it, and it came out wonderful!! Thanks for the recipe! Glad you found these! Try these recipes next, too! I’m shocked. I’ve.. Well.. Never made a successful anything with coconut flour before. But these are great! Will make again! So happy to hear that Bethany! I opted for a thicker bar and doubled the recipe. Used honey. Used heavy cream instead of almond milk (due to nut allergy). Used high coco content chocolate morsels (instead of chopped chocolate). Baked as directed (lowered to 325 degrees for last 5 minutes) in 12 x 8 glazed stoneware pan sprayed with nonstick coconut spray. Cooled about 10 minutes and drizzled with a mixture of melted chocolate chips with a little heavy cream (which I ended up spreading out). Came out light and airy. Delicious! Great! Glad those swaps worked out. Perfect! Glad you loved this one 🙂 Try this bread, too!